You need far fewer electronic devices than you think. All I carry is my iPhone and my iPad Pro. Done. My rule here is very simple: take a phone and one other device. Unless you have a major reason why you need three devices, take only two. For me the second device is my iPad Pro, and before that it was my MacBook. If you need a Mac, take a Mac and use your phone for anything else. But decide if you even need that second device — I take mine strictly because if I can squeeze in writing time, it is worth having the iPad Pro. But I could do it all with my iPhone if I wanted. There’s lots of ways to talk yourself into taking one more device, but I’ve always found that when I travel with three devices, one will always go unused. There’s nothing more frustrating than lugging something around you don’t use. I’m glad you love your Kindle, but do you really need it for the one night you are gone? For the week you are gone? It sure is a nice device, but if you take it — do so knowing that it is a luxury item and you are taking it because you want it, and not because you need it. For me there is nothing better than this. It is everything I need in one small box about the size of a MacBook Pro charger. Additionally it means I only ever need access to one plug, so I don’t have to rearrange furniture in hotels to charge stuff overnight. At about $26 on Amazon, it is a heck of a deal and not worth stressing out about if it gets lost or broken. This setup becomes more complicated if you take a computer with you — instead of USB based charging devices. MacBook users can find some great chargers which do both USB-C and USB charging. For everyone else: sorry but likely your best option is packing your laptop charger in addition to one for your phone. Another note: Don’t rely on your laptop to charge your phone. Yes, many people do recommend this, but every time I did this I regretted it a lot. It’s just not a convenient way to pack, and here convenience wins out over packing less. It’s a cumbersome mess and I avoid it. The micro USB is only to help out people I may be with, and sometimes it is accidentally pulled out of my kit. I also like to keep the micro USB cable on the off chance I toss in a battery backup — as that is how mine are recharged. That’s all the cables in my kit, and they charge everything I pack. I also pack a Lightning to HDMI adapter for my iPad, which the HDMI cable is used for. This has come in handy when I want to stream Hulu/Netflix to hotel TVs, and for the odd hookup to presentation displays in different situations. It’s a pure luxury item for me. And a USB camera connection kit for the iPad — again not needed, but nice to have. Sometimes that will be swapped for the SD card reader depending on where and what I am doing. Of everything I carry in my electronics kit, these are the most expendable. For years I have been traveling with huge battery backups, and for years I have not been using them much. The only time I ever seem to need a battery backup is when I am at a conference or in San Francisco (for some reason my battery dies fast there, must be poor cell reception). Every time I hit the airport, or an airplane, there are more than enough readily available plugs to charge my gear with. Further, I just don’t seem to need to charge anything. Perhaps I am an anomaly there, but I simply don’t have a ton of use for battery backup packs. So to recap: San Francisco trips get a battery backup packed, otherwise I don’t take one. I pack an older version of this model. I keep all of my stuff in a GORUCK Wire Dopp.2 It does a great job of keeping this stuff all organized and in a slim case. I also like that I can open it and have nothing go flying out — perfect for when you need to dig out a cable on the plane. I wish the buckle was not as bulky, but that’s a rather minor complaint about what amounts to the best wire holder I have found.3 This kit can hold a lot of stuff really well, and equally holds very little really well. It also tends to keep my cables from coming unwrapped, and thus they tend to stay tangle free a bit better. 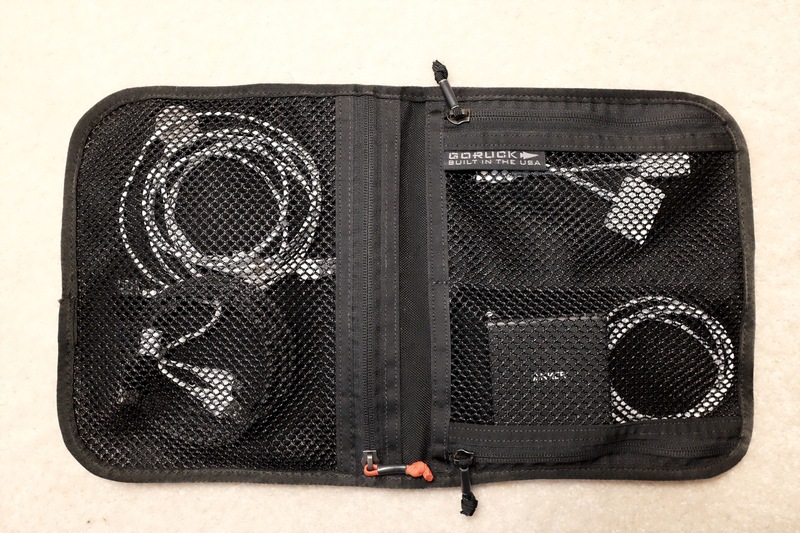 As with my toiletry kit, I keep my charger kit packed and ready to go at all times. This way I never worry about whether I have what I need to charge my stuff — I always have it in the kit because it never leaves the Wire Dopp. I also don’t use this same kit on a daily basis as it is too much stuff — and that would also make it more prone to be missing stuff the next time I pack my bag. I used to pack a flashlight on every trip — that’s a thing a lot of people do. But I actually never used it. I am sure if I really needed a flashlight it would have been awesome, but I never did. And I always have the one on my iPhone. But my camera. Ugh. I love to travel with it, but it adds a lot of weight and bulk. I also use it infrequently on most trips — it ends up being another thing I lug around. And my iPhone has a pretty great camera too. Ultimately, I would say that I pack the X100T in the GR1 Field Pocket about 60% of the time I travel. When I do that I pack one extra battery and that’s it. If I am traveling for more than three days, I add in the battery charger. If you can convince yourself not to bring a larger camera, you’ll be happier every moment where you aren’t taking a photograph. Despite being overly gadgety prone, I actually carry very few gadgets with me. Like with the clothes I have been talking about, a good set of gear can do everything you need it to do.